The Mexican national team was about to participate in the Copa América Centenario, a special edition that for the very first time was going to take place in the U.S.. The conquer of the continent was such a big challenge, and so the team needed the support from all the Mexicans, regardless the part of the world they were. The strategy consisted on generating buzz worldwide before each game from the group stage, concentrating the messages around the hashtag #AméricaParaLosMexicanos. During the pre-match hours, different influencers initiated the supporting strike along with the Team from multiple locations in the world, triggering a deluge of messages that always reached its top meanwhile the players were fighting for the victory. 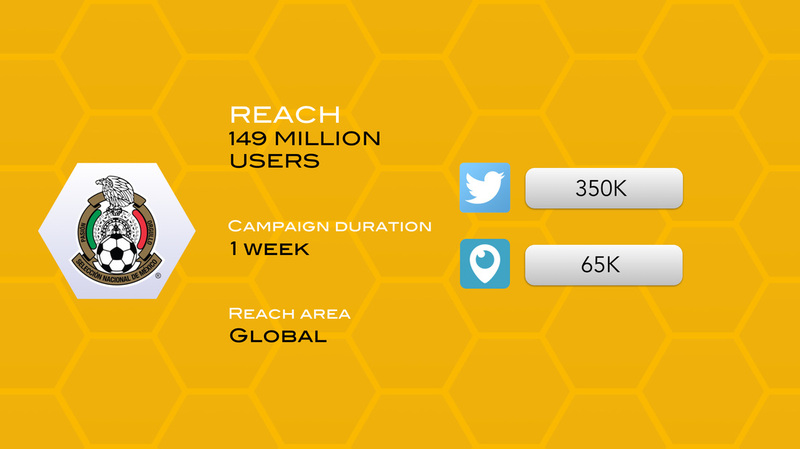 More than 40 influencers from all over the globe took part in the campaign, including the legend Ronaldinho Gaucho, publishing from Twitter and live-streaming their impressions of the match from Periscope, which allowed to reach a target not so engaged to soccer that ended up joining the supporting movement thanks to that wave of collective enthusiasm.